Immersive education can been viewed as a class in which virtual reality, game-based learning and immersive environments are used as teaching techniques. A popular teaching tool or immersive technology that you may already be familiar with is Minecraft. Immersive technology is technology that makes the user feel and experience a digital world as though they are inside it and technology that changes the way we experience the world around us. There are lots of immersive education initiatives that include the latest technology such as: Virtual Reality, Humanoid Robotics, 3D Printing, Augmented Reality, Holograms, Game-based learning and more. I recently attended an edutech conference in which I had the opportunity to experience emerging and immersive technologies like virtual reality headsets as well as see a humanoid robot dance to Michael Jackson’s Thriller on command, based on a pre-installed code. I experienced the Google Cardboard VR experience for the first time a few months ago, thanks to my tech-savvy colleague who surprised me with his latest gadget; a Google Cardboard Viewer. Upon first reaction, I was doubtful because it looked like the furthest thing from technology, a flat piece of paper (or cardboard paper). After watching him for a few minutes constructing his viewer and then using it as a headset with his phone, curiosity got the best of me and naturally I wanted to know what all the fuss was about. The way that it works is that you install the Google Cardboard app on your Android smartphone you’d have access to a few demo apps and a 360 degree Video Channel, that is essentially YouTube videos that were filmed using 360 degree cameras that allow you to visualise the 360 degree picture or video. You feel immersed in an experience with the freedom to change perspective and focus on another aspect of a video through virtual reality. You can experience new music YouTube videos in VR. There are two distinct types of experiences I found: computer animated games or apps built for VR and live recordings of people and places. Scenario based learning for specialist subjects e.g. Science. Experience workplace scenarios where you have to make key decisions and can practice in a safe VR environment, before you practice in the real world. This could be conducting science experiments, carrying out practical demonstrations that you would otherwise not have the finances or resources to accommodate. This could open up a world of opportunities. Advantages: At prices starting from £10, it is very affordable to buy a class-set. As more companies mass produce viewers, prices will become competitive and affordable and the quality of viewers will also improve with foam padded viewers (see image above). You have the flexibility of using different types of phones. Easy to assemble and lightweight so you can carry them from one classroom to another. Logistics aside, I can really see students engaging more with learning through VR. Disadvantages: there are not many apps that have been developed yet as it is a new product. Until actual apps are developed with education in mind, it is not very useful for students or teachers. Managing the use of VR within a classroom environment may be tricky because sound would be played out loud through the smartphone speakers so potentially this could be a loud classroom, so headphones are needed and this means you’ve lost 2 senses; sight and sound which makes classroom management tricky. Alternatively, this can be something they use independently i.e. at home or within a social learning space. Google Cardboard can be an excellent tool for education if used creatively. An increasing number of apps are being developed and I expect it won’t take long for further gaming and educational apps to emerge. This is a product to watch. Oculus, a Facebook owned company are the name behind ‘Oculus Rift’, and ‘Gear VR’. Samsung’s Gear VR headset, powered by Oculus, is a very stylish virtual reality headset which comes in at a much pricier £169 a the time of writing. This allows you to slot in your smartphone but it only works with Samsung S6 and Galaxy Note at present. As it is designed with specially designed straps to fit on your head, you don’t actually have to hold the headset so you can use it hands-free (I did, just incase). It also felt stronger than the Google Cardboard. What surprised me was that they actually do something similar – allow you to experience virtual reality. One useful difference was how easily you navigate through functions and move to different scenes by simply hovering your focal point over a button to select this. I found Google slightly fidgety with this aspect of navigation. Tomáš Mariančík is the Creator of ‘The World of Comenius’, which is a project that uses Oculus Rift VR for education, named after the famous Educator, John Comenius. Comenius came up with the concept of ‘learning by play’ or ‘obtaining ideas through objects rather than words’ and believed in ‘focus on understanding, instead of learning by rote memorisation’. Tomáš Mariančík organised an incredible educational eLearning experiment took place at mendel Grammar School in Czech Republic using the Oculus Rift DK2. Students participated in a virtual biology and anatomy lesson and used special Leap motion sensors that allowed students to move things and manipulate objects using gestures. “the most effective type of learning is where the learner has more interaction and is more engaged. Virtual Reality allows students to learn by play”. 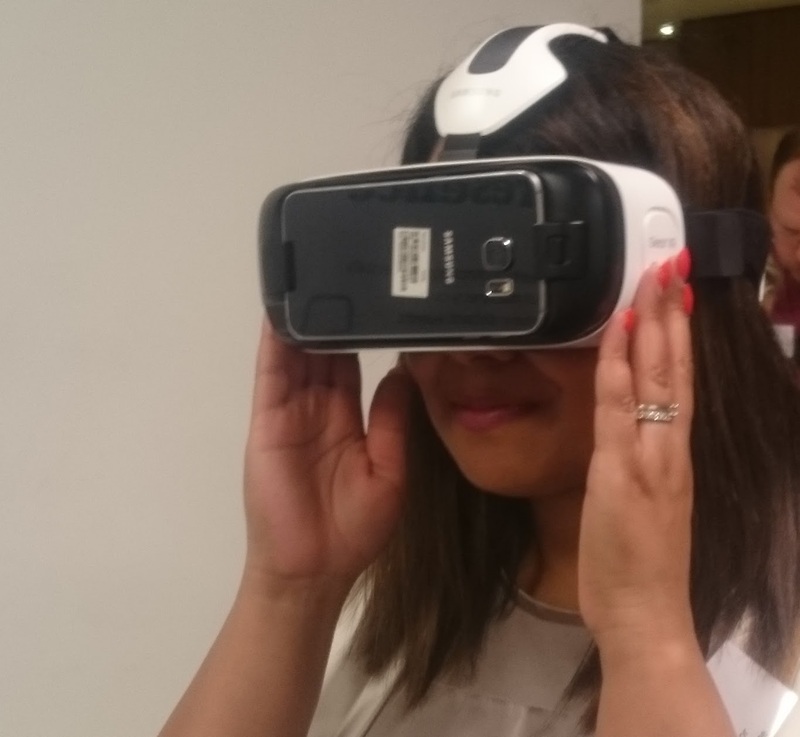 Learn more about the eLearning experiment in Czech Republic using Oculus Rift for education. What would be very interesting is if students could work collaboratively together for problem solving in these VR settings. Also, how animation and game design students would use Oculus Rift software to create games as part of their studies by experiencing what their project would look like at every stage using the power or VR to create and test their design. There are lots of apps that are being developed for Google Cardboard and Oculus Rift in Education that are worth exploring. I think there are a few areas to consider when thinking about the use of VR. Research from Rabindra Ratan suggests students display a higher psychological presence when using Oculus so they are more actively engaged with the medium. He goes on to discuss a correlation between student behaviour and how this is directly linked to their avatar (virtual character) in the VR experience. In my interactions, feedback from Teachers who teach students with special education needs report similar findings to what Ratan states about a ‘higher level of psychological presence’ and behaviour using virtual avatars. Teachers reported that some students with autism, often find it difficult to engage in the physical world because of difficulty with social anxiety. However, in a digital or virtual world where they can express themselves through a digital avatar to deliver a key message (e.g. using Voki, GoAnimate, PowToon), students are less hesitant and can express themselves better (with language and tone) than when they had to present examples standing up in front of the class. Why? Because there was less pressure and they could express themselves through technology than directly. Technology is here to help. It will allow us to experience the world in a way that was not possible before. It is here to make learning fun and engaging so it can only be a positive thing to embrace new teaching tools. However, given that one size does not fit all, VR will work better for some subjects than others as Ratan points out, but it is worth exploring as a learning tool. “Immersive technologies are great way to learn, they also are one of the best ways to measure learning”. This entry was tagged comenius, education, elearning, Gear VR, google cardboard, immersive, oculus, rift, robot, technology, VR. Bookmark the permalink. DigiDesk Project – What is it all about?